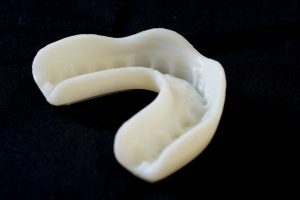 Dutch start-up 3Dmouthguard has developed and 3D printed custom-made sports mouthguards to protect teeth and mouth injuries in any type of active or extreme sports. Mass Portal helped to develop 3D printing process using Royal DSM materials. 3D printing material Arnitel® ID2045 from Royal DSM dried in Mass Portal Filament Dryer FD1 and printed on Mass Portal XD20.